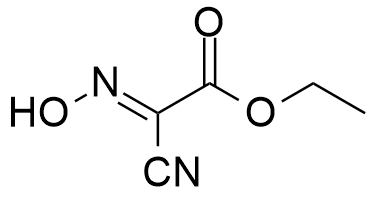 OxymaPure®, an ideal additive used with carbodiimide coupling methodology, for amide bond formation. The 2-cyano-2-(hydroxyimino)acetate displays a remarkable capacity to suppress racemization and an impressive coupling efficiency in both automated and manual synthesis. OxymaPure® derived products are extensively adopted in pharmaceutical platform for the synthesis of various scaffolds such as Weinreb Amides; Oligobenzamides; ester bond formation and more. OxymaPure® is a registered trademark of our company, Luxembourg Bio Technologies Ltd., and we are the exclusive manufacturers. OxymaPure® being in the process of REACH registration due to it’s massive demands. OxymaPure®, pKa=4.60 – The Pharmaceutical Grade of Ethyl(2-hydroxyimino)cyanoacetate. OxymaPure® is a registered Trade Mark of Luxembourg Bio Technologies Ltd. The product produced in unique technology which developed by Luxembourg Biotechnologies R&D. This technology allows to achieve a free of salts product with more than 99.5% purity and to control the ratio between the active Oxim to none active Nitroso. OxymaPure® has been tested for oral toxicity and dermal irritation and was found as non-toxic and non-allergic. Safety investigations clearly showed that OxymaPure® has less risk of explosively and flammability than existing products for same purposes Safe (LD50 = 300-2000 mg/kg) and has no limitation in land, sea and air transportation (low risk of explosion). OxymaPure® is considered as an excellent replacement for HOBt, HOAT, HOOBt, HOPO, Cl-HOBT and other analogues (without change of protocol). 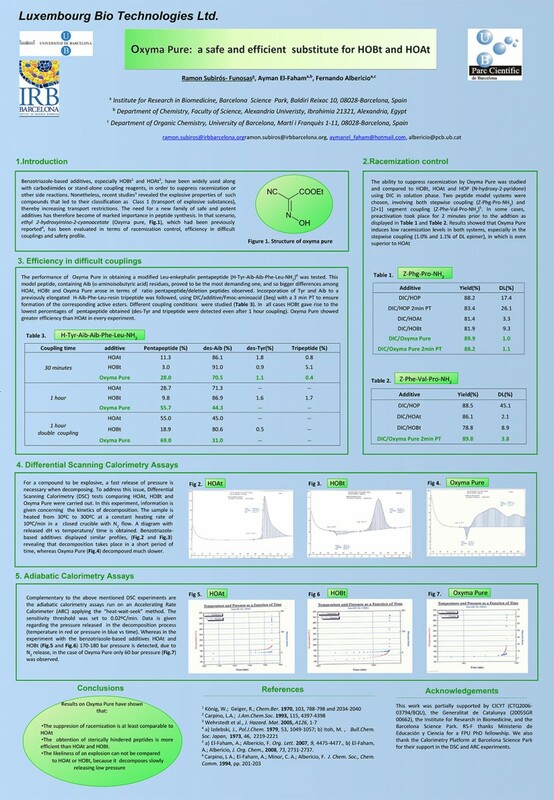 OxymaPure® gives results comparable to HOAt in step-wise Solid Phase Synthesis. Less epimerization than HOBt in fragment condensation reactions. OxymaPure® as pH modulatory agent can be used in the prevention of base driven side reactions and its effect on 2-Chlorotrityl Chloride Resin. OxymaPure® offers the best balance between reactivity and stability, in addition to its high solubility in a broad spectrum of solvents. The highly polar nature of OxymaPure® influences the water solubility, which is essential to removing the coupling byproducts in solution-based acylations. On the other hand, the great solubility of OxymaPure® in organic solvents has prompted its use in the evaluation of green alternatives to DMF. Combination of TFFH and OxymaPure® raised the percentage of the target Aibpeptide in comparison to TFFH alone (98% vs 95%). In TFE–DCM (1:1) system OxymaPure® and DIP is effective additive in cyclization (lowest yield of intermolecular coupling product). Ideal for peptide synthesizers using microwave heating . OxymaPure® reducing almost completely the proline-based overcoupling during solid-phase elongation of Pro-enkephalin (H-Tyr-Pro-Pro-Phe-Leu-NH2). J. M. Collins, K. A. Porter, S. K. Singh, and G. S. Vanier Org. Lett. 2014, 16, 940−943. S. N. Khattab, R. Subirós-Funosas, A. El-Faham, and F. Albericio Eur. J. Org. Chem. 2010, 3275–3280. 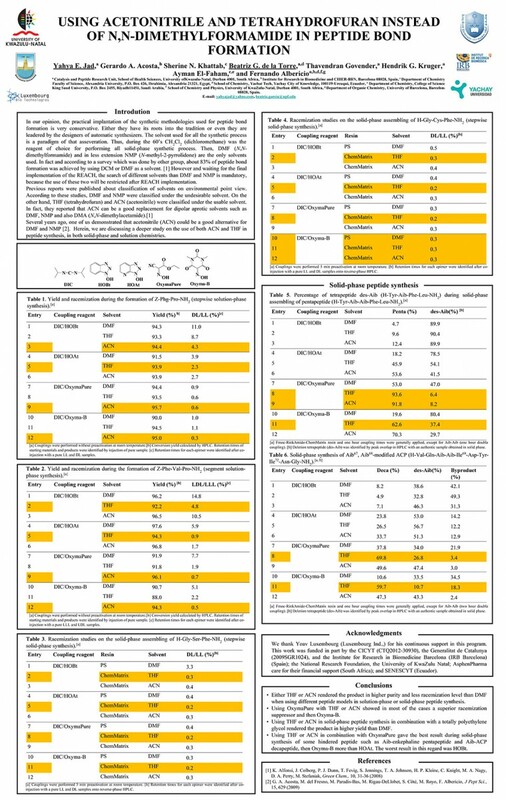 OxymaPure: An Efficient Additive for Peptide Synthesis to Replace the Benzotriazole-Based HOBt and HOAt with a Lower Risk of Explosion Ramon Subiros-Funosas, Rafel Prohens, Rafael Barbas, Ayman El-Faham, and R. Subiros-Funosas, R. Prohens, R. Barbas, A. El-Faham, and F. Albericio Chem. Eur. J. 2009, 15, 9394 – 9403. N. B. Palakurthy, D. Dev, S. Rana, K. C. Nadimpally, and B. Mandal Eur. J. Org. Chem. 2013, 2627–2633. R. Subiros-Funosas, A. El-Faham, and F. Albericio PeptideScience Volume 98 / Number 2.